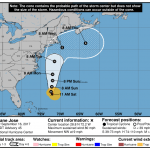 The tenacious Hurricane Jose is back after a break from the triumvirate of tumultuous storms, Hurricanes Irma, Jose, and Katia. Jose has been spinning in circles in the western Atlantic since I last reported on him September 12. On September 14, he weakened to Tropical Storm Jose. On September 15, he strengthened to a hurricane once again. Jose is not forecast to severally affect the U.S.
1. 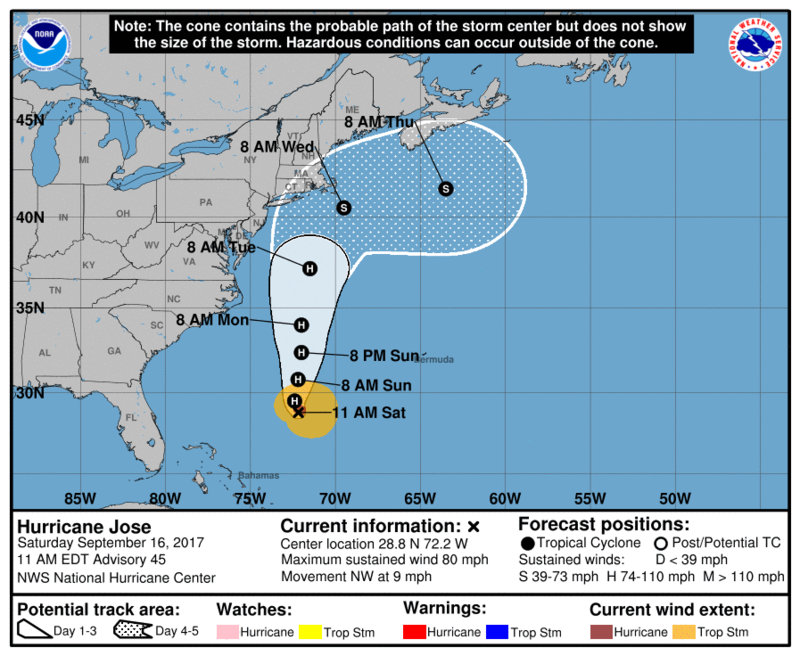 The center of Jose is forecast to pass well east of the North Carolina coast on Monday, and tropical-storm-force winds are currently expected to remain offshore of the North Carolina Outer Banks. However, an increase in the size of the storm or a westward adjustment in the track forecast could bring tropical storm conditions closer to the Outer Banks, and interests there should monitor the progress of Jose through Monday. 2. While Jose is currently forecast to remain offshore of the U.S. coast from Virginia northward to New England, the large cyclone could cause some direct impacts to these areas and any deviation to the left of the NHC forecast track would increase the likelihood and magnitude of those impacts. Interests along the U.S. east coast from Virginia to New England should monitor the progress of Jose through the next several days. 3. Swells generated by Jose are affecting Bermuda, the Bahamas, the northern coasts of Hispaniola and Puerto Rico, and much of the U.S. east coast. These swells are likely to cause dangerous surf and rip current conditions for the next several days in these areas. This entry was posted in Nature and tagged hurricanes, storms by Chris Siems. Bookmark the permalink.